Chelsea Women have reached the semis of the Champions League for the second year in succession after a magnificent late winner by Maren Mjelde in the French capital against Paris Saint-Germain. Just when it looked like the quarter-final second leg was going to extra time, after PSG had clawed back the two-goal advantage the Blues held from the first leg at Kingsmeadow, up popped Mjelde to net the most vital volley of her Chelsea career. “Conceding the goal early in the second half made it difficult for the team to cope,” admitted manager Emma Hayes at the end. “But we had prepared for it. Ultimately, we conceded one goal with a mistake from our goalkeeper, and defensively we got caught on the right-hand side in the wrong moment for the first goal. 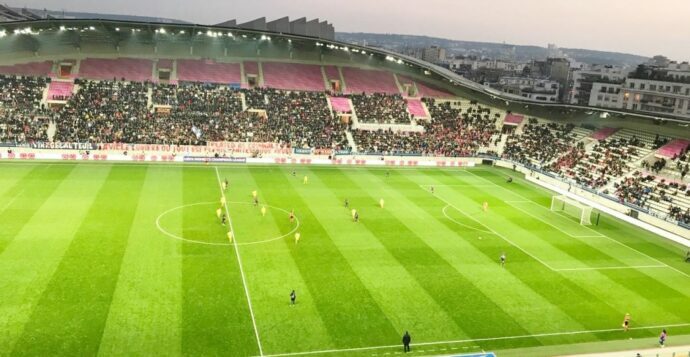 Hayes described her team as “a spirited group”, and felt she could sense the all-important away goal coming – even into stoppage time… a goal which meant PSG had less than three minutes to score twice to nullify that away advantage. “When Karen (Carney) picked up the ball and dropped it in that space, I knew there would only be one outcome,” said Hayes. Certainly the Chelsea captain’s crossfield ball was the defining moment, teeing up the volley that made Mjelde the heroine on the night. The most relieved person on the pitch was Chelsea’s goalie Ann-Katrin Berger, whose own goal had brought the ties level. But manager Hayes was hugely supportive of her netminder at the end, and refused to allow any criticism of the goalkeeper who seems set to be the first-choice fixture at Kingsmeadow for the next three seasons. So although Chelsea lost 2-1 in Paris, that away goal made all the difference, and the 3-2 aggregate scoreline means it’s the Blues who power through to the semis. As an added bonus for Chelsea, their recent nemesis team, Wolfsburg, were knocked out in the quarter-finals by Lyon – but that’s out of the frying pan, into the fire as Lyon are now the clear favourites to win the competition… and are the team Chelsea must face next. Also in contention, Barcelona and Bayern Munich. Bayern play Barca and Lyon face Chelsea on April 20, with the return legs a week later, on April 27… a match that will see Kingsmeadow sold out, and which also bumps Chelsea’s league game against Yeovil to a fresh date.